I can't vote but I am excited about the election too :). Talk about cravings! I just finished lunch (or dunch?? dinner+lunch. i just made a new word, thank you!). I know, too late for either! Not that i can vote, but this election has gotten everyone excited! Anything masaledar is good as a stress buster. I just has a super-delish, spicylicious falafel-pita :). Manisha if you are a prawn lover try my Tallele Vale Sode. It is a prawn mince. I have been a veg for more than 2 decades but still recommending as that use to be my favorite:). Onions, prawns and spice are enough to lead anyone to bliss. I had no idea that the tail-shell could be eaten! I've used shrimp-shells for stock, ya, but...you're serious? I won't die from a punctured whatever? While I was reading the recipe I was thinking indeed that it runs like a pickle recipe...the only big difference, in that case, being that the shrimp would be fried fairly dry so it would soak up the acidic khaar. I think. I haven't made a seafood pickle yet. Thinking about it. Salmon. Terribly Goan, eh? You can start chanting now. Here even all my friends and family were saying hope obama wins. 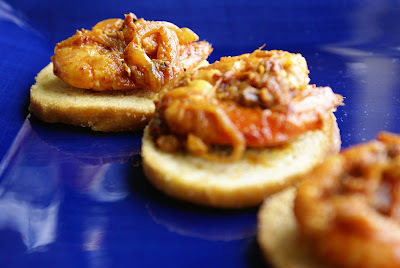 At least you had this delicious goa prawn nibbles to nibble on. Manisha! Even if you had started binting your nails you would have stopped long time ago :) With Prize that Colorado joined in the Blue Fun as well. Just luvvverly (since we are deliberately misspelling names ;) ... Yayyyyy, Obama is the president elect!! I am sooo excited! Congratulations to you, me and everyone living in the United States of America. I couldnt vote for him but sure rooted for him. Yum1 And no more nail-biting. If I knew this was what you were going to make for election-day, I would have come over. You have such a great turn of phrase! 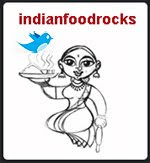 And you cooked my favourite - Goan prawns, yum! it doesn't mean that u shud blog only for NoBloWriMo! 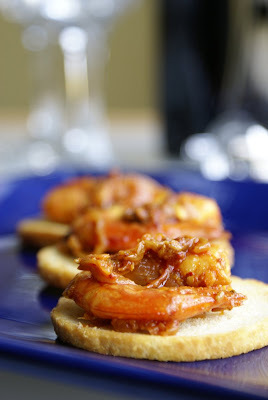 missing u.
Yummy - love this recipe and the spicier the better - thanks for posting! Do you know how to make Coconut milk rice?